The owl is a living radio telescope with sonic disks surrounding the eyes made of feathers which funnel the slightest of sounds directly into her high range ears.Unlike most birds of prey, owl’s satellite dish eyes are forward facing and extra large for her head-size, giving her binocular vision. One ear is situated higher than the other. 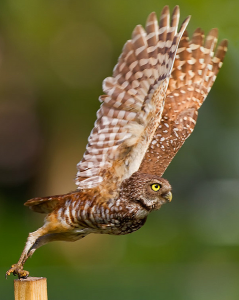 This auditory asymmetry, along with the ability to pivot the neck 220 degrees allows the owl to pinpoint the exact location of a sound without moving her body. By turning her head until the sound is heard in both ears, owl then knows she is staring straight at the origin of the sound, i.e. her prey. Once accurately positioned, her large nocturnal eyes are then able to locate a tiny object in pitch dark with minimal use of energy. Her flight feathers are fringed with a second layer of fur, making her gliding approach completely silent. Her fierce vision and hearing along with her silent cloak of feathers and razor talons makes Owl a master night hunter. Her medicine speaks of struggles after the sun has set, remedies for sleeplessness, and overcoming superstitions of darkness. When owl medicine is hovering in your life, your powers of observation are pitch perfect and you can not be deceived by others. Messages and information are assessed with flawless precision and action is taken in a discreet and effective manner. Owl medicine teaches how to identify and stop people who seek to take energy away from you. Owl knows that power is not ours to keep, power is only to be used for a brief time as it flows through our life situations before moving on in it’s mysterious current. 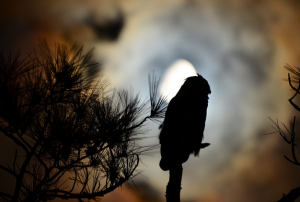 The night medicine of owl has a powerful and conflicting grip on the human psyche which whispers lessons of confronting fears and protecting personal power. The meaning of her symbol varies from culture to culture and has been immersed in superstition for centuries. Ancient Greek mythology found her to be wise. Ancient Hebrew mythology found her to be courageous. The Pawnee view the owl to be a symbol of protection while the Ojibwa and Pueblo view her to symbolize evil and death. But all the myths of owl speak of clairvoyance, astral projection and magic. Magic is chemistry and physics beyond our human ability to explain via scientific method. Once a phenomenon is identified either with technology or math, it ceases to be considered magic and becomes common knowledge. The ability to locate and identify remote, elusive information is the medicine of this night bird. The notion that the owl is an agent of misfortune or an ill omen is a fear- based superstition that should be questioned with Owls own rigorous medicine to tear away at limiting beliefs. There are no bad animals in nature. When we demonize, or turn a another living being into an enemy to be wary of, we are, in fact, cloaking our primal fears of instability. Instability is the truest nature of all things, as all things fall apart. Acknowledging our fear of being attacked allows us to, like owl, pinpoint and handle any potential threat with effortless accuracy. A demon, on a psychological level, is a God we have fallen out of communication with. And so when Owl or any animal appears in your dreams as frightening or monstrous, consider what challenging aspect of life you may have been avoiding lately. It is impossible to live life separate from the spiritual forces beyond our comprehension. We must commune with the spirit realm as we must breath oxygen. Though Western culture has tried to prove otherwise, we must find some way to relate, one way or another on a daily basis with the aspects of life which can never be understood. Seeking to understand that which can never be understood is not the same as relating to it. Analyzing the Great Mystery is not the same as communing with it. Communing involves a surrender to the powers beyond us. Either through dance, music, story, art, ceremony, or science, we must let the demons of our fears in so that we can connect with the God beyond them. If we try to hide from the rather inconvenient voice of tears, rage, and pain that swell up from within us, those very voices will swoop down, Godlike, and consume us, forcing inevitable communion. Seemingly ‘unfounded attacks’ of emotions are, in truth, an opportunity to evolve out of our limited understanding of self that keeps us afraid. Owl’s consume their prey whole, bones, fur and all. She then generates a pellet of indigestible material which is coughed up and released. Her medicine shows that when we trust the natural process of adventure and accept a challenge directly, the inessential will fall away and need not be fretted over. Owls, like Swans, have a distinctly awkward adolescent phase, reminding us to be patient with ourselves as we hone our skills. Though it may be possible that we are born with certain gifts, none of us are born with the ability to execute or express them. We are all born as babies with no tools except trust and hope. Owl cautions taking on an endeavor before you are ready and advises practice, practice, practice to master any skill. 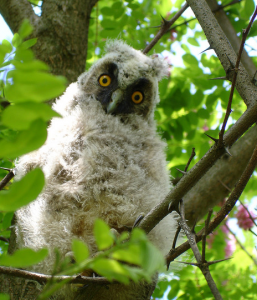 Owls do not build nests and are content to find abandoned nooks in trees, cliffs, or buildings to call home. Owl medicine people are happy to make do with the given conditions and can make any place cozy. Both mother and father assist in raising their young but once a nest of babies has grown, new partners are often found for the next years family. Unlike hawk or eagle medicine, owl medicine emphasizes the neutrality of life on Earth, giving people the objective space to learn painful lessons through misadventures and egoic pursuits. The owl totem can often appeal to foolish power seekers who wish to gain a personal advantage over someone in isolation from their environment. The way you treat your environment is the way you treat yourself. The space to fail again and again is held within the owl totem and her lessons can be painful. Yes, it is possible to cut that forest down. But what will we learn once we do? Do we really need to learn the same lessons again and again? Owl’s neutrality asks that we develop foresight in our actions and to use the neutral zone of Earth to reduce confusion and suffering. If your actions have taken power away from another being in some way, be assured that the same power will one day be taken from you. That is Owl’s law of neutrality. The owl totem is a very good energy to call upon when dealing with issues of sleep and restlessness at night. If her medicine appears in your card readings she may be asking you to look at the quality of your sleep. “Night Owl Syndrom” is a sleepless condition that involves an under exposure to light during the day and an over exposure to light after dark. In our modern era it is easy to spend all day inside with less than daylight causing a lack of vitamine D. An over-exposure to light in the evening, (reading with bright lights, computer monitors, and TV) can confuse our natural circadian rhythms and cause a neurological challenge for the brain when we attempt to fall asleep. If you ever experience flashes of light as you fade off into sleep, you may have taxed your optical nerves with too much light during the evening. It is advised to turn off lights when the hours of night inch towards 9pm. If that is not possible, it is also often suggested that you consider wearing sunglasses as you read or watch tv in the evening. Harsh lights at night will keep you up. For a solid restful nights sleep, stop working and allow night time to happen. It can be a very interesting challenge to see if you can stop placing your mental attention on things, even the smallest of news articles and just lie in bed and do nothing. Some people consider reading at night a way to relax. But if you are trying to go to sleep, anything requiring your mental attention will continue to stimulate your brain and keep you up. In ancient times it was not physically possible to continue working once the sun set. Now we must place daily attention on managing our energy so that we do not separate ourselves from the natural rhythms of the planet. We do not live on top of the planet as a separate energy. We are of the planet, we are the planet. Conversely, it is also important to observe the vocabulary western medicine uses to describe a sleep condition as a ‘syndrome.’ A ‘syndrome’ suggests a disfunction. A disfunction is often just a limited definition of ‘normal’ based on a social standard. It would be absurd to think that the entire human population could all go to sleep at the same time every night and wake up in the morning ready for the ‘work day.’ If every one’s sleep patterns were calibrated for night, the pipes of our functioning society would clog. Some people simply operate at peak performance after dark. They are nocturnal in nature. This is not a problem for those whose live in harmony with this personal rhythm and whose work and goals are easily pursued at night. This situation only becomes a ‘syndrome’ if you do not personally wish to be nocturnal. Much of the anxiety of lying awake at night comes from the false belief, set into our heads as children, that we ought not to be awake, that it is wrong we are up so late, oh, dear, how will I face tomorrow if I am tired? This sense of wrongness can compound our struggle to relax with an added social complex. If you are awake at night, perhaps you simply aren’t tired. If you think you ought to be tired, it may help to first accept the fact that you aren’t. Permit yourself to not be tired and see where the flow of that rhythm takes you. If sleeplessness does persist to a frustrating degree, call on the healing precision of owl medicine to assist you in finding the root cause of night tensions. It could be that you are not breathing well at night and waking up frequently. In which case there are remedies that do not involve medications. It could be you are reading or watching content with an intense emotional message late at night making your mind busy. Or it could be there are subconscious thoughts affecting your ability to relax, in which case, methods of meditation, investigation, and clearing hidden thoughts abound through journaling or discussions with a trusted friend. Find a way to know the contents of your thoughts and work through the delusions of stress. The political message of Owl medicine can be seen in her ability to hunt skunks. Due to her reduced sense of smell, owl is one of the rare predators of this smelly creature. Skunk medicine, when out of balance, often involves a lot of unnecessary hype and posturing which Owl sees right through. Her medicine reminds you to be ever aware of people who wish to trick you and use you as a resource for personal gain. If Owl medicine is strong in you, you may find that people are often nervous in your presence. Owl medicine perceives any attempts at deception with a hunters vigilance. If out of balance, she is asking you what it is you have allowed yourself to be deceived by and why. Use your common sense to hone in on the ill-intent that someone may have aimed at you. Addressing manipulation head-on rather than living in shy tolerance of abuse will not only heal you, it will heal the world. As Owl reminds us, we are not part of the world, we are it. We are as inseparable from our environment as Owl is to her feathers. She does not have feathers, she is them. Whatever you accomplish the world accomplishes. Our first responsibility is to dissolve the feelings of fear and separation within our inner life which compel us to attack our environment, an external aspect of our own self. Addressing our personal inner state will change outward reality. Owl’s eyes burn bright yellow in the night, bringing the light of day into the dark of night. There is, even in the darkest of hours, a way to listen and locate the tiny stirrings of movement that will lead us out of any impasse.